This category contains the 200 series Stainless Steel Teflon Hose Ends that are designed and manufactured to precise AN hose dimensions. This is a selection of -03 AN stainless steel Teflon hose ends, bonjos, banjo bolts and associated stainless steel fittings. 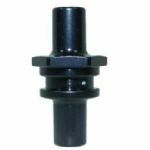 We also stock Aluminium and Steel Teflon Hose Ends that are listed in there own category shown on the Home page, or click here to go direct. 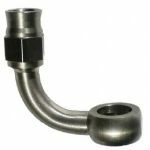 Our Stainless Steel Teflon Hose Ends will fit any compatible stainless steel braided AN Teflon hose that does not have the additional plastic coating. If you wish to use plastic coated Teflon hose you will need to remove the coating to allow the olive fixing nut (sometimes called the B nut) to go onto the hose. This is not a desirable thing to do because it looks untidy and can create a section of hose that may be prone to kink. 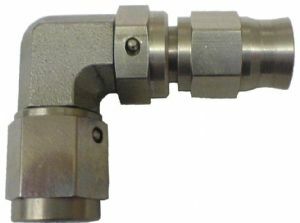 Our AN Stainless Steel Teflon Hose Ends are machined from marine grade stainless steel. 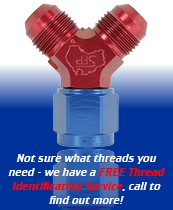 Want Your Stainless Steel Teflon Hose Ends Fitted? Speedflow does not charge for fitting Stainless Steel Teflon hose ends on to hose. The only qualifying factor is that you purchase the hose ends and hose directly from us. If you'd like us to fit your hose ends please call us on 01934 864310 or send an email. We will assemble your hoses at no additional cost and often without delaying the despatch of your order. 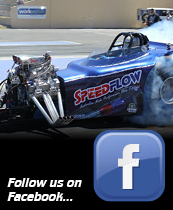 Speedflow wants your buying experience with us to be as good as it could possibly be. If you plan on fitting your stainless steel Teflon hose ends why not download the Speedflow AN Hose & Fitting Guide. You can use the link on the side of this page or go direct to the download page here.